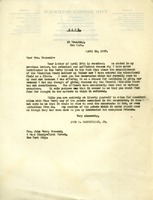 John D. Rockefeller, Jr. acknowledges receipt of a letter from Mrs. Hammond and advises that she not share with Berry the contents of the confidential memorandum he sent to her. He recommends that any points mentioned in the memo should come to Berry as though they had been made by interested anonymous friends. 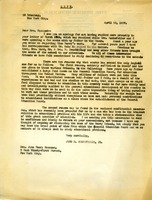 Copy of letter to Emily Vanderbilt Hammond from John D. Rockefeller, Jr.
Letter stating that John D. Rockefeller, Jr. declines to give to Berry College because of the work he already does through the General Education Board, although many friends have brought Martha Berry's work to his attention. Rockefeller encloses a confidential memorandum from the General Education Board so that she may more completely understand their point of view for declining to contribute to Berry. Mr. Ochs encloses a letter from John D. Rokefeller Jr. who writes that in the judgement of the General Education Board Berry is outside of its field. He states that he does not fund education except through the Board.